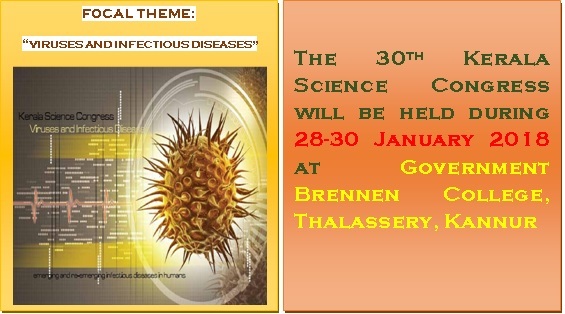 The Kerala Science Congress is a three day annual event conducted by the Kerala State Council for Science, Technology & Environment during the last week of January. The annual event provides a forum for young researchers, academicians, technologists and others from around the State and elsewhere to exchange knowledge and share advances in their research findings and development of technologies of relevance especially to the State. The Kerala Science Congress is a three day annual event conducted by the Kerala State Council for Science, Technology & Environment during the last week of January. The annual event provides a forum for young researchers, academicians, technologists and others from around the State and elsewhere to exchange knowledge and share advances in their research findings and development of technologies of relevance especially to the State. The event will consist of technical sessions involving theme lectures by eminent scientists, research presentation by young researchers, memorial lectures, Special sessions, post-graduate student interaction session and children’s science congress. Talented young researchers will be honoured with the ‘Kerala State Young Scientist Award’ during this event. ‘Best Paper Awards’ and Poster awards will be awarded to selected papers presented under the different subject areas. A national exhibition on S&T with participation of major R&D institutions will also form a part of the Science Congress event.